The chief international envoy to Bosnia, Lord Ashdown, says he has sacked the Croat member of Bosnia's tripartite joint presidency. 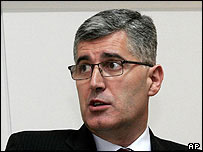 Dragan Covic, accused of serious corruption, had refused to step down. He is the third member of Bosnia's presidency to be forced out under international pressure since the Office of the High Representative was set up. Lord Ashdown oversees implementation of the Dayton peace accords that ended the 1992-95 Bosnia war. "I decided to require Dragan Covic to step down from his position in the presidency with immediate effect," Mr Ashdown told reporters in Sarajevo. Mr Ashdown, backed by the US and European Union, had urged Mr Covic to resign after state prosecutors charged him with customs evasion, corruption and abuse of office. The alleged offences were committed between 2000 and 2003. Prosecutors say that, when Mr Covic was finance minister, he gave unwarranted tax breaks to his business associates. Mr Covic said last week that he would not resign unless he was found guilty. He was backed by his party, the nationalist Croatian Democratic Union (HDZ), and accused the international community of trying to marginalise Bosnian Croats in their own country.